Film music and SingerSongwriter John Coinman has the independent, lyrical feel of the southwest in these ballads and rockers. John is also the main purveyor of songs for Kevin Costner's band. 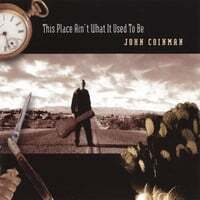 John Coinman's CoraZong debut album 'This Place Ain't What It Used To Be' features thoughtful, melodic songs, that speak of dusty highways, misbegotten romance and the ghost of James Dean. John Coinman says his songs 'ooze the Southwest'. And they do. From open instrumentation to slightly weathered vocals, easygoing tempos and references to landmark locations. "I'm always trying to find a way to put new and old sounds together in my music," muses Coinman beneath a shade tree outside the Raging Sage Coffee House in Tucson, Arizona. "It's important for a musician to have an identity and the identity I have is that of a Tucson singer/songwriter who is associated with film. There's a need to keep that going because people naturally expect to hear certain types of sounds and songs when they buy my albums. But I also grew up with the music of The Byrds, Bob Dylan, Neil Young, The Band, Roy Orbison and I'm influenced by modern groups like Coldplay, The Wallflowers and Modest Mouse. People will hear a lot of new stuff in my next release "Songs From The Modern West". John Coinman wrote songs for the films Clay Pigeons, Head Above Water, Goin' To Montana, Slumber Party Massacre II and the television series Melrose Place. John was the music supervisor for the Academy award winning film Dances With Wolves. Coinman has also three songs in the Kevin Costner film The Postman, in which he appears as a musician/actor as well. Coinman's friendship with Kevin Costner led among other things to the formation of the band Roving Boy. With this band the pair had a Number One single Simple Truth in Japan in 1990 and made one, now very collectable, album. In 1998 John was named Songwriter Of The Year in Tucson Arizona. In 1999 he was voted Best Local Performing Artist in a citywide readers' poll. John Coinman wrote and performed music, with John Densmore of The Doors, for Horses And Drums, a series of spoken word performances by Michael Blake, author of Dances With Wolves. He also wrote and performed songs for the Bruce Springsteen sponsored play about steelworkers called Lady Beth. John Coinman's songs move like the wind. And put your ear to the ground.